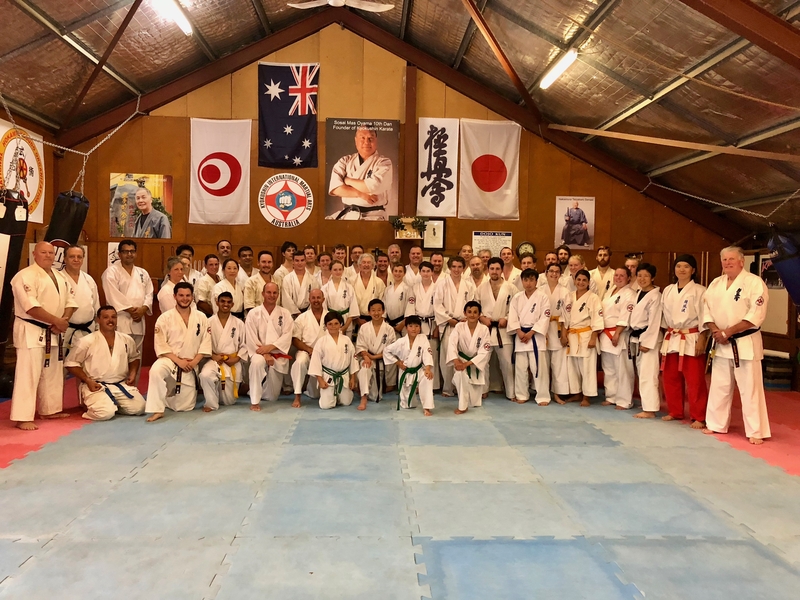 September 2018 saw Kyokushin International Martial Arts Australia host its third Shihan Ken Seminar. Shihan Ken Ogura with nunchaku, March 2015. 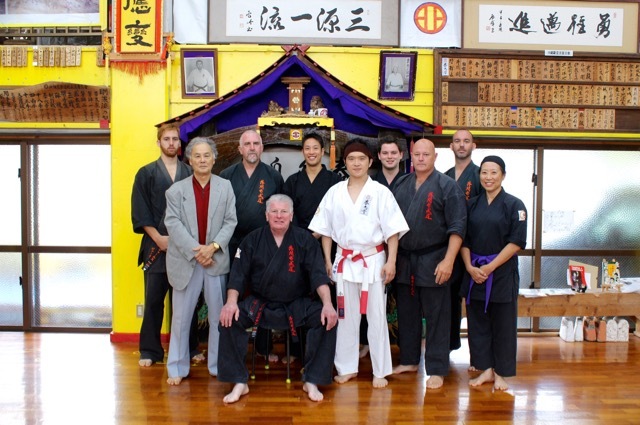 KIMAA tour group with Sensei Hokama and Shihan Ogura. KIMAA traditionally runs two seminars in Sydney twice a year, in addition to those conducted at the other dojos. In the 2015 Japan Group Tour, senior KIMAA karateka met and trained with Shihan Ken Ogura (8th Dan) at Sensei Hokama’s dojo. The group were all impressed with Shihan Ken’s martial arts ability, and his excellent teaching. Hanshi Howard Lipman invited Shihan Ken to Australia to conduct a seminar in 2016, focusing on bunkai (self-defence application from techniques, particularly in kata) and Kobudo. This was repeated in 2017 and again this year, due to the seminars’ continuing success and the interest of students. This year, Shihan Ken (who lives in Nagoya, Japan) arrived in Australia on Wednesday September 19th. He came by the Kids Class at Turramurra Dojo with Hanshi Howard, Sensei James Sidwell and Sempai Jasper Choi. The seminar formally began on the Thursday night at Turramurra. The smaller group focused on bunkai from Sanchin, Pinan Yon and Pinan Go. 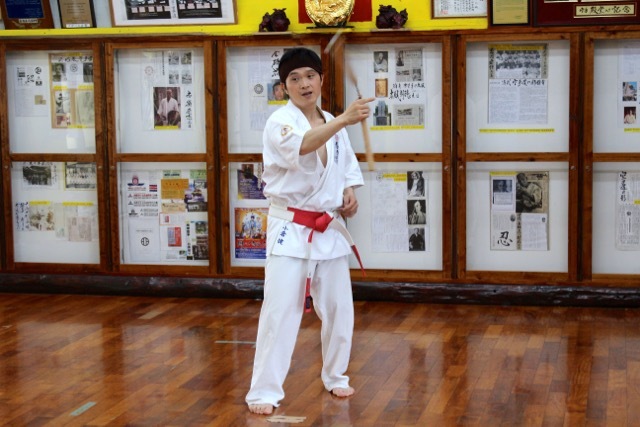 Shihan Peter Olive resumed his role as Shihan Ken’s partner in bunkai – a.k.a. crash test dummy! 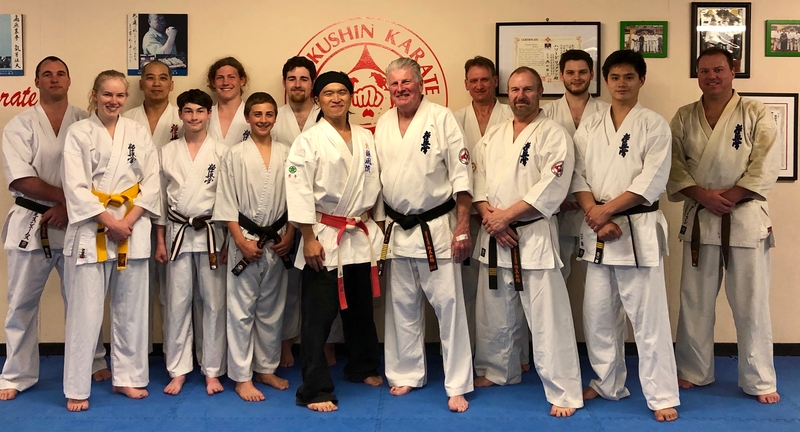 The Thursday night group with Shihan Ken Ogura. The Friday night drew a large crowd. Students from Ballina and Lismore dojos arrived, under the leadership of Sensei Mark McFadden, Sempai Wally Gray, Sempai Patricia Tan and seniors from Ballina Dojo. The first wave of karateka from Young Dojo, including Sensei David Craigie and Sempai Mark Long, also arrived. Training focused on the same kata as the previous day – revision for the now ‘advanced’ students while everyone else caught up. Special guests for the seminar, just on the Friday night, included Kancho Doug Turnbull and some of his KIKO students. Also appearing over the weekend was Kie Matsuoka, one of Shihan Ken’s students, who came out from Japan to train with Shihan Ken and KIMAA. After training, the class went to dinner at Gordon Noodle City. The Friday night group at the 2018 Shihan Ken KIMAA Seminar. The seminar continued on the weekend at Annangrove Dojo. The rest of the Young Dojo contingent arrived. The day began with a basics session, conducted by Hanshi Howard. Students then broke up into groups based on grade level. Black belts studied Seienchin bunkai with Shihan Ken, while junior grades were taught by other seniors elsewhere. Juniors took a turn with Shihan Ken, while Yudansha revised Pinan Ura kata with Shihan Peter and middle kyu grades practised Pinan Ni with Sensei Ben Ng. Then the middle-senior kyu grades went inside with Shihan Ken to look at a group bunkai drill for Gekisai Dai, assisted by Sensei Paul Finnerty. Junior kyu grades then had a turn learning new kata bunkai with Shihan Ken. The senior grades worked on the formality, intensity and accuracy of Sanbon Kumite. Shihan Idir Bahamid had middle kyu grades revise Naihanchi kata, then Shihan Rick Cunningham taught the group some bunkai for that kata. A few students took turns over the course of the weekend being Shihan Ken’s new demonstration partner, including Sempai James Campbell and Sempai Jason Lambe. Shihan Ken also took some seniors through various Kobudo drills after lunch. At the end of the day, Hanshi Howard presented Sensei Alex Lloyd his 3rd Dan in Kobudo and Sensei James Sidwell his 2nd Dan in Kobudo. 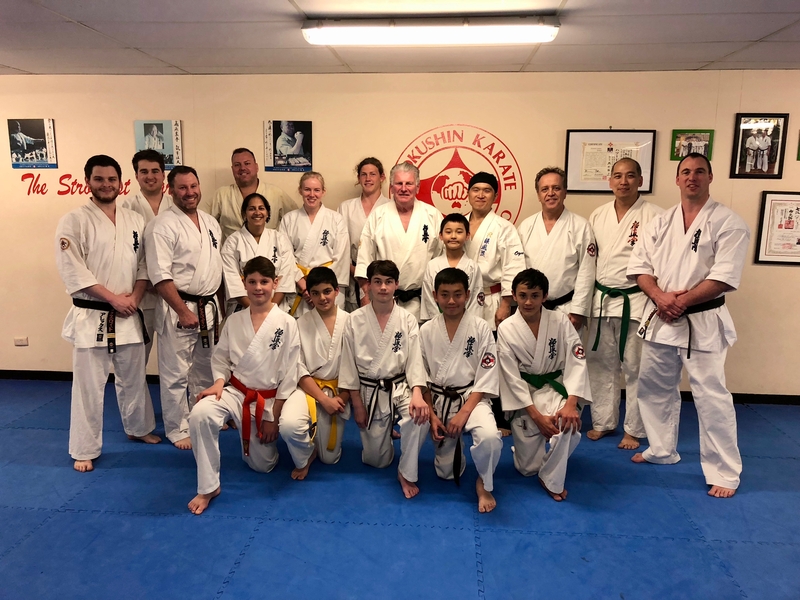 They had been graded the previous month by Hanshi Howard and Shihan Rick, and now were formally presented with their certificates from Sensei Hokama (10th Dan). It was a long day with a large number of training sessions. Well done to all. Thanks go to both days on the weekend to Sensei Ian Holdaway, Kirsti Cunningham and Masumi Lipman for keeping everyone fed. After the last photos were taken for the day, a dinner was held at Shihan Rick’s home. At the end of Saturday at the 2018 Shihan Ken Seminar. Training resumed Sunday morning. Things began with an outdoor basics session – during which, a long selfie stick and drone were flying around to film the training. This and other footage compiled over the past few years was put together for the new KIMAA video. KIMAA Little Lions were in attendance on the Sunday morning. Shihan Ken held a class for the kids while the adults split into groups for Kobudo training, based on their experience level. Sensei Mark Shelmerdine, Sensei Paul Finnerty, Sensei Mark McFadden, Sensei Alex Lloyd, Sensei James Sidwell, Sensei Ian Holdaway and Sempai James Campbell taught Bo and Sai to the groups. After lunch, the kids were done for the day and the adults went back to training with Shihan Ken. This included some revision of kata bunkai and sanbon kumite. Finally, Shihan Rick conducted a bunkai test – having students rotate through different pairs, demonstrating bunkai from various kata at random. KIMAA has firm standards of students being able to demonstrate bunkai in Kyokushin Karate gradings – the quantity and complexity of which being dependent on their grade level. These seminars are an integral part of this preparation. A group demonstration of the Naihanchi kata was recorded on the Sunday afternoon. The final session of the seminar was held on the Monday night at Turramurra Dojo. Shihan Ken had fun in the Kids Class, including some sparring. The adults class focused exclusively on bunkai from the Okinawan Seipai kata. At the end, Sensei Mark, Sensei James and Sensei Alex demonstrated the Kyokushin Seipai kata for Shihan Ken, which he found most impressive. At the end of the night, Shihan Ken expressed his warm thanks for his reception in Australia, and how much he has enjoyed watching the organisation come along over the years he has been affiliated with us. The final night of the 2018 Shihan Ken Seminar. 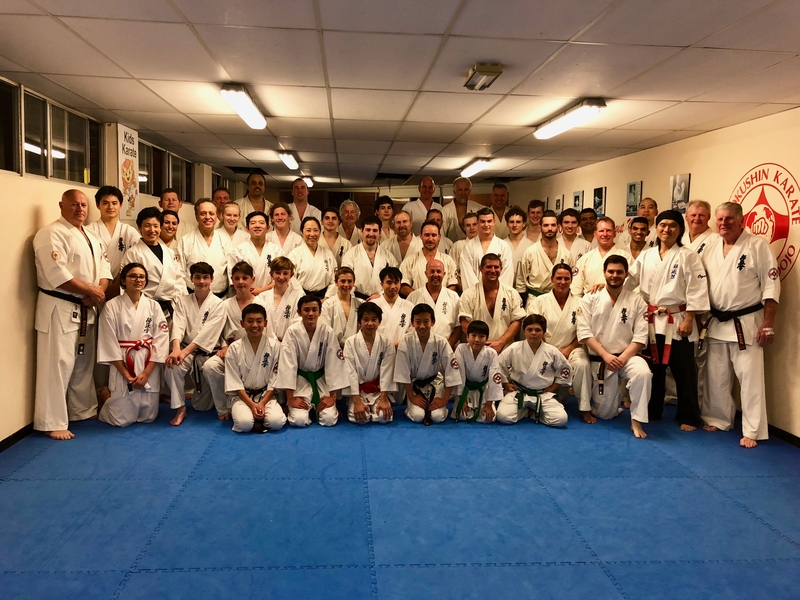 Thanks go to everyone who travelled to Sydney for the weekend, especially of course to Shihan Ken Ogura for travelling from Japan on this third occasion to teach KIMAA students. Further thanks go to all the seminar organisers, including Hanshi Howard Lipman and Shihan Rick Cunningham. It is now over to the instructors and students who attended the seminar to revise what they learned, consolidate their knowledge and continue to develop their skills – to keep travelling the path.